According to the Miami Herald, “[i]t should come as no surprise that the Financial Fraud Enforcement Task Force kicked off the first of its mortgage-fraud summits in Miami.” No doubt they came to Miami for a “summit” because they wanted to see firsthand what a moldy foreclosure looks like, not because it’s sunny and warm here in February. The subject, however, is serious. If you’re an honest person who wants a place to live in Miami or Coral Gables, the recent history of rampant mortgage fraud poses a continued challenge to your financial security. Many homes for sale are still priced too high relative to fundamentals such as incomes, rental costs and historical rates of appreciation. To what extent is the market still overpriced because of phony mortgage money? There’s no way of telling for sure, but the problem is real. According to the Herald, one fraud ring bought properties through their own mortgage brokerage, flipping the properties to one another for higher and higher prices until they ran out of funding, leaving the lenders with $7 million in losses. More commonly, mortgage brokers, motivated solely by quick fees and in contempt of borrowers’ ability to pay, fed loans through the financial system, supporting higher and higher sales prices until the bubble burst. With phony lending came higher prices. With the end of phony lending, prices have fallen. But how can you tell whether those artificial effects have been washed out of prices in the Miami or Coral Gables neighborhood where you’re thinking of buying a home? If major institutions like Citibank don’t really know what they have on their books because the loans were products of mortgage brokers’ imaginations, how can you be sure what you have in front of you now? You can’t. Fraud and phony lending goosed prices throughout Miami and Coral Gables, not only for the subject homes but for all other properties in the surrounding area. And there’s no way to know for sure that the last drop of bogus pricing has been wrung out of the system. To protect yourself, follow defensive buying practices. Focus on fundamentals. Do area incomes, rents and historical rates of appreciation support the price you’re being asked to pay? If not, you might become another injured bystander. The home at 8400 SW 52 Avenue (a.k.a. 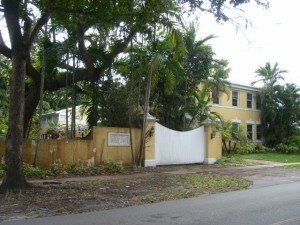 School House Road) in the High Pines and Ponce/Davis vicinity Miami (adjacent Coral Gables) sold in November 2009 for $2.3 million. That’s barely more than the $2.25 million that the seller paid for the property in 1999 — and less after transaction costs (e.g., brokerage commission) are taken into account. Not that the seller, Charles Stiefel, was in financial straits. Glaxo SmithKline bought Stiefel Laboratories for $2.9 billion in July 2009. Sellers at the high end may have more staying power — but they also have more going power! 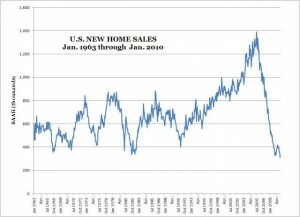 Last month in The REF, a renewed tailspin in new home sales was noted. The latest figures from the Census Bureau at the Commerce Department ain’t pretty. Sales dropped to a record-low seasonally adjusted annual rate of 309,000 in January — way below December’s 342,000, and well under the previous low of 329,000 in January 2009. Recordkeeping began in 1963. Home prices in Miami fell slightly for the three-month period ending December, compared to the period ending November, according to the Standard and Poor’s Case-Shiller Home Price Index. The index declined from 149.08 to 148.66, a drop of 0.3%. The Case-Shiller index is not broken down by locality or price range, so specific conclusions about, e.g., Coral Gables or the luxury market cannot be drawn. Incidentally, the index for the New York metro area declined again, from 173.24 at the end of November to 171.91 at the end of December, a drop of 0.7%. The house at 2711 San Domingo Street in Coral Gables is a window onto the state of the mid-range market for real estate in Coral Gables. The property is a mixed bag, with a small house (3 BR, 2BA, 1860 sf), but a larger lot than most others on the street (12,800 sf). A big refreshing pool is a plus, but is exposed to the St. Theresa (Little Flower) church school and parking lot. 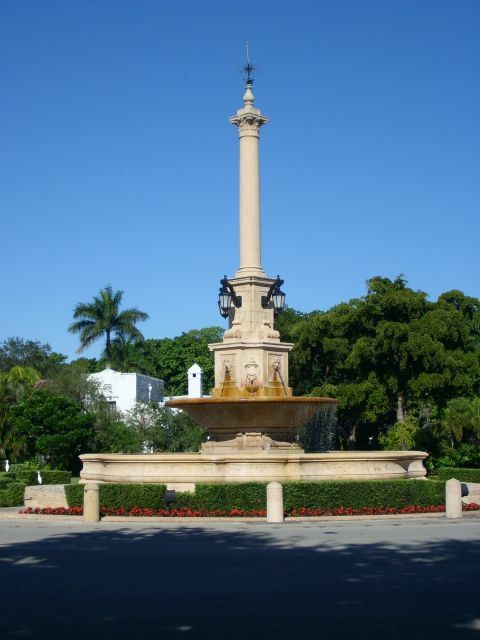 The neighborhood is one of the more desireable in Coral Gables, just around the bend from the Biltmore Hotel. The property was on and off the market for a while, but finally sold last month. When I spoke with the owner (during one of its unlisted spells), he wanted well north of $700,000 — and that was already a reduction. But he was feeling the strain of paying both local and French property taxes (he was a French citizen and had to pay property tax to France — on property located in the U.S.!). Evidently, the patience of buyers wore down this particular seller, because the property just sold for $525,000. Don’t feel sorry for the seller, though. The $525k sale price represents a handsome return of about 8.5% since the previous sale for $219,000 in 1993. That’s a high rate of appreciation for residential real estate, even for a desirable neighborhood near the Biltmore Hotel in Coral Gables. Thanks in significant part to a decline in the cost of housing, the core CPI inflation gauge for January 2010 posted the first month-to-month decline since 1982. You might want to keep that little tidbit in mind the next time someone selling real estate in Miami or Coral Gables tries to scare you into thinking you’ll miss the boat if you don’t buy now. Real estate prices in Miami and Coral Gables are unlikely to mount a serious comeback in the context of a deflationary economy. Sellers might like to think that prices can rise for home purchases while falling for home rentals. That kind of wishful thinking hasn’t worked out too well lately. During the boom, the cost of buying real estate in Miami and Coral Gables deviated way beyond any normal relation to the cost of renting. That deviation has barely begun to resolve itself, and falling rents would only exacerbate the imbalance, pulling home values further downward. Granted, the government’s methodology for calculating inflation has changed over the years, with a systematic bias toward reducing the stated inflation rate compared to previous methodologies. (See www.shadowstats.com.) But by any measure, core inflation is hitting a new low despite the firehose of money that the government and Federal Reserve have aimed at the economy. Score one for the deflation camp. The Mediterranean-style home at 8345 Ponce de Leon Road, in the Ponce/Davis neighborhood of Miami (adjacent Coral Gables), sold in December 2009 for $2,764,500. That’s 19.9% below the previous sale price of $3,450,000 in December 2005. Built in 2004, 8345 Ponce de Leon is a 6BR, 7BA, 8212 sf luxury home on a 43,560 sf (1 acre) lot. The $2.7645M sale price works out to $337/sf. The Census Bureau recently reported that housing starts in January rose to a seasonally adjusted annual rate of 591,000, up 2.8% from a revised December figure of 575,000. The numbers carry a margin of error of about 11%, so the monthly gain is murky. Compared to a year ago, however, starts are up by 21% with a margin of error of 12%. So year-over-year, there is clearly more activity. Pulling the camera back, the housing industry is clearly struggling to get back to business, compared to previous cycles in which the level of activity made a clear “V’ bottom. It will be interesting to see how the data weather the scheduled expiration of the $8,000 homebuyer tax credit. Contracts must be signed by April 30 and deals must close by June 30, and some of the rebound in starts is believed to have resulted from buyers and builders getting projects underway in time to meet the deadline. Seems mad for just $8k, but could be true. These are national numbers and are not necessarily indicative of the real-estate markets in Miami and Coral Gables. Yet real estate in Miami and Coral Gables followed the national data up in the boom and down in the bust, so give the data some consideration. The De Soto Fountain, piece de resistance among fountains in Coral Gables. Located at the intersection of De Soto and Granada Boulevards — prime real estate between the Biltmore Hotel and downtown Coral Gables. Plenty of single-family homes in Coral Gables have been lost to foreclosure or short sale, but few have been substantial in size or quality. And although a fair number of larger homes have been the subject of a foreclosure filing, that is a far cry from proceeding all the way to repossession and bank-owned sale. Despite the disastrous real-estate market of the last few years, only about 20 REO (bank-owned) sales in Coral Gables have involved properties bigger than a breadbasket. 828 Valencia Avenue sold for $625,500 in January 2010, after selling for $1,225,000 in April 2006. 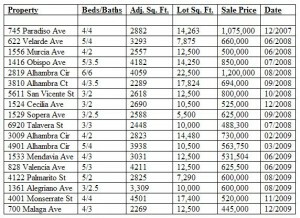 At 4,211 adjusted square feet, the 2010 sale represents a mere $148/sf. But you get what you pay for. Significant parts of that consisted of what appeared to be outdoor patio and brick porch space that had been enclosed. At least one room seemed to have significant mold growth. And most buyers would generally have seen a need for total renovation. 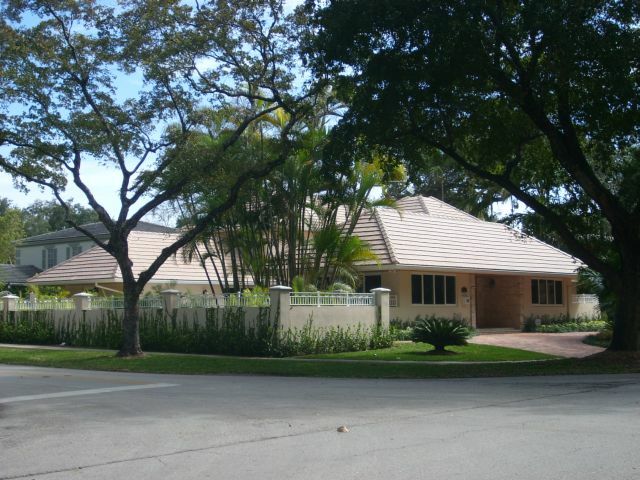 The property is located just off De Soto Avenue near the Coral Gables landmark Venetian Pool. 4901 Alhambra Circle sold for $563,750 in March 2009, after selling for $2,100,000 (courtesy of Countrywide Home Loans) in May 2006. 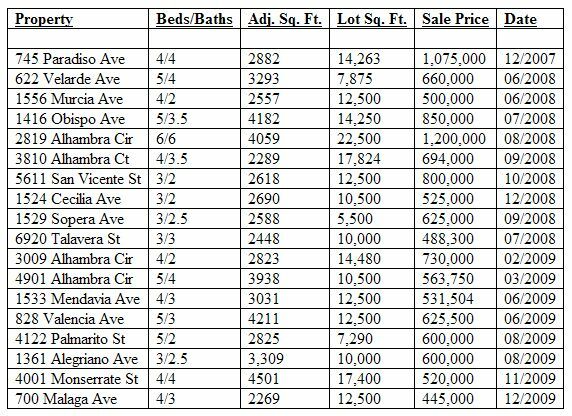 At 3,938 adjusted square feet, the 2009 sale represents $143/sf. 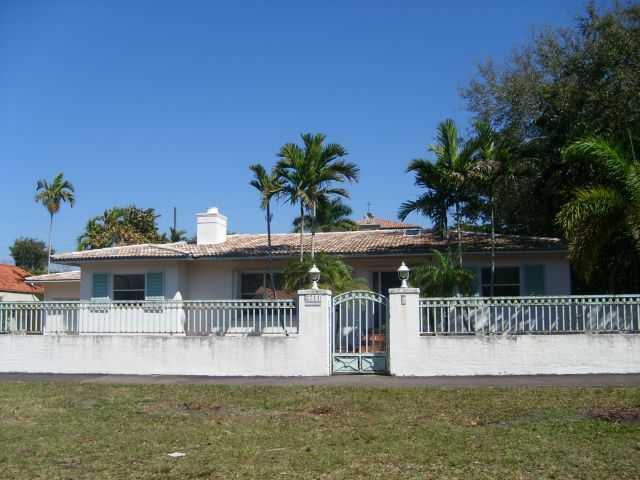 Again, the price was commensurate with the condition of the house, which had a leaky roof, interior water damage (which always raises the possibility of mold growth), and the usual Miami-foreclosure green pool. But this property has already proved itself: The buyer in foreclosure fixed it up and flipped it for $1,030,000 in a transaction that closed earlier this month.